Start your tour with the white house built by James habon 1783, the house of all the 44 presidents except the white house, after that walk through 17th street NW to the constitution AV pass by the organization of the American states, nonprofit organization strive to promote human rights and freedom. The daughters of the American revolution, a female volunteered organization that seeks to encourage and promote loyalty. The American Red Cross head quarter, in charge of the disasters and other natural emergencies. The House of the Lock keeper. the name of the house is driven from the name f the man who kept the key for the canal which was in the constitution avenue between 1813 and 1870, he used to live in this house with 13 kids. Also we will walk by The second world war II, the Thomas Jefferson, FDR memorial, Martian Luther king memorial. 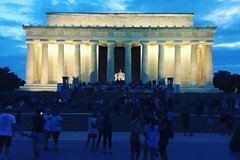 The Tour end at the Abraham Lincoln memorial the 16th president of the united states and the great emancipator. The stop also includes the Vietnam veterans memorial and the and the Korean memorial.